Very fine leather. Love the red color. The sleeves were very long, perhaps made for size tall but not indicated, I folded them under to suit my size. I was delighted my delivery was prompt and satisfied throughout the whole process. 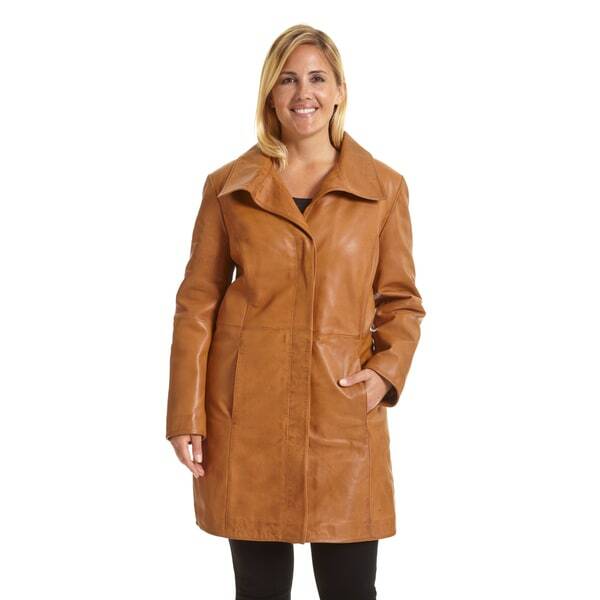 Remain warm when you venture out during cool weather wearing this fully lined lambskin pencil coat. Two pockets keep your hands warm or store your gloves or keys. I really like the length..car coat style covers just enough. I ordered in the brown and a size 3x. The size was a little to small but not uncomfortable. I just can't button it. I am pleased with the suppleness of the leather. I might order a red one eventually. Very poor quality. Sewn irregularly. Fit is off-super large but weirdly shaped arm holes. Too shiny. Will be returning, but am surprised that Overstock sells such poor quality. Beautiful coat and size was perfect. I purchased 2 and I love them! I have been looking for a leather coat for a long time. I just love this coat, the feel is so soft, fits perfectly and I would most certainly buy it again or as a gift. So far I have no complaints. The leather is soft and just as lovely as described. The fit is good. I have only worn the coat a few times at this point but I couldn't be more pleased with my purchase. Soft and warm, not heavy. Comfortable. Looks good. Quality is okay, runs a bit small. A bit pricey for online shopping, but, I was quite pleased with the quality of the material, it's a pretty sharp jacket. Yes, I would recommend. The leather was very good quality and the person loves it! "Will you be getting this coat back in stock in size 3X? Thanks!!!" "Question Please any X size Measurements, Thank you. 1. Width measurement of the upper arms - bicep area? I have thick arms need 10"+ laying flat (one side) ***If bicep area 20" around or more*** 2, length of the sleeves, please? *** 3. what X Size please 4. What are the hip measurements? Thank you for all of your help - this coat is a good deal if it fits!!!! Kathleen"